Amazon Price: N/A $22.00 (as of 2019-04-24 13:54 – Details). Product prices and availability are accurate as of the date/time indicated and are subject to change. Any price and availability information displayed on the Amazon site at the time of purchase will apply to the purchase of this product. 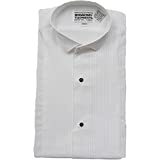 This is a men's white tuxedo shirt with wing collar includes both black studs and regular buttons. Button cuffs can also use optional cuff links. This shirt is easy care permanent press, 35% cotton/65% polyester. Includes black bow tie. Perfect shirt for a prom, wedding, or any other formal event.